On higher horsepower performance engines, the stock motor mounts tend to break under repeated full load conditions. Whether you're looking to replace broken motor mounts or protect against them, our urethane motor mounts are an excellent solution. In addition to reliability over the stock mounts, you will discover an improvement in throttle response. 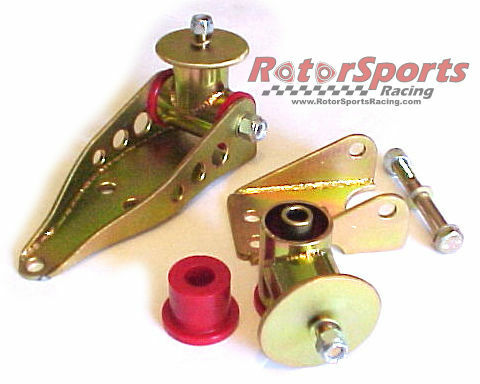 Urethane motor mounts are available for 2nd and 3rd Generation RX-7's. $150 core fee refundable upon receipt of old cores. Subject to availability of cores in stock. Our popular 3rd Generation RX-7 urethane motor mounts are reconditioned from stock motor mount cores. Each core is then specially fitted with a urethane bushing and a special urethane disc which reduces transferred vibration without sacrificing strength. These are recommended for high performance engines and/or repeated full load conditions. Is there excessive increase in vibration with the stronger urethane motor mounts? This is the most commonly asked question concerning our motor mounts. There have been no precise measurements of vibration done compared against the stock motor mounts. We do not recommend these mounts on automatic FD's. There is a big difference in the load characteristics that increases vibration as a result of the automatic transmission. But we do recommend them for all manual drive high-performance RX-7's. Verbal descriptions from one driver to the next can read like night and day sometimes. We describe it as noticeable only at low rpms, when starting out, but nothing that is really excessive or uncomfortable. Most customers agree and are happy with the results, but there are a handful of drivers who report that the vibration is excessive to them. So use your own judgement. There is going to be some increase in vibration due to the characteristics of having a stiffer motor mount. This should be expected by design. The stock rubber mounts do reduce more vibration but in doing so they do not last very long when repetitive stress is placed upon them. Many performance modifications sacrifice some degree of streetability comfort while enhancing performance. This is the choice that drivers must make when making goals and expectations. But again, we standby the description as being minimal and more responsive to the driver. *We request that you send us your existing motor mount cores for modification, or pay a core charge deposit that will be refunded upon the return of your cores after exchange. Due to the many requests for core exchanges, we may not have extra cores in stock available. 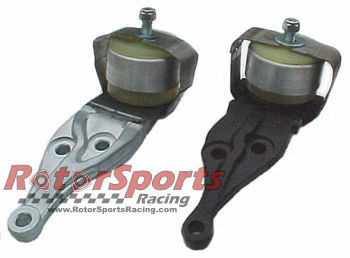 Urethane engine mounts give quicker shifting and improved throttle response, than stock mounts. Will fit vehicles with wet or dry sumps. * When sending in cores, please include your contact information in the shipment. Please state whether you are providing cores for modification or returning your old cores for a core charge refund.